I was having a short conversation with Anna Lisa Giannini that was about something really important — it was all about the boot mug I got one day as friends and I got together for coffee (chai for me). She said coffee tastes better in a Christmas coffee mug. I said something about how drinking chai from a cowboy boot mug makes it taste better and sent along the photo here (you can try to be lucky enough to get served in this if you stop by Otherlands on Cooper in Memphis). Yes from there it got high brow and Anna asked if that was a cowboy boot or a Santa boot. That’s what resulted in the genius that followed as I replied “Isn’t Santa a cowboy? He has a herd & big heart ;)” and that’s when I knew I had to write this blog post. We’ve all heard about Santa’s toy shop and movies like the Santa Clause will try to suggest Santa has one profession or another. I’ve even bought a book about evidence he is a fireman. But the more I think about it, the more certain I become that Santa MUST be a cowboy or a farmer. Bad Weather? No Problem! — Whether or not he actually PREFERS cold weather I don’t know but there is indisputable evidence that many times extreme weather conditions including BLIZZARDS attempt to get in the way of a day’s work. Not nice but work gets done as needed. Caring for Animals — There is a herd that is incredibly well cared for. Understanding exactly what to mix in the food to keep livestock healthy and support their development has been a point of discussion and study. Good Boots! — Those boots can take anything! With the long days he works in all sorts of weather, he depends on the best. Giving — His main line of work isn’t all about him… He’s busily contributing to making the world a better place. Great Women in the Loop — The Mrs. doesn’t just hang out at the house. A true partner in the operation, she is the office manager, keeps the books up-to-date, is part of the livestock operation, manages employee issues, keeps her eye on the long-term, etc. She can go it alone if needed too. Did you see her in “The Year Without Santa Claus”? Long Hours — Sleep is something that can always come later when there is a job to be done. Delight Children — Kids find incredible excitement in a visit. And getting in the buddy seat or to sit on a knee to tell & hear stories is a dream come true! Something that needs to be photographed and shared! The Right Voice for the Task at Hand — A booming voice can be a definite asset in directing reindeer or talking over loud equipment but just because you have a booming voice, doesn’t mean you need to use it all the time. Downtime means its easy to become one of the most soft spoken people ever. Hauling Things is Daily Work — The only appropriate modes of transportation include storage — horse-drawn sleighs and pickup trucks rock! Late Night Snacks — After a long days work, he finds loved ones may leave him a glass of milk and a couple of cookies to snack on. When he’s returned home long after others have gone to bed though, sometimes he may find beef roast and potatoes which can seem far more satisfying! Red & Green Rock — Looks great in red (but green is pretty awesome too)! Hearty Laughter — When someone comes up with a crazy suggestion, a sincere laugh may be the best way to greet it! What facts did I miss? It was everything I imagined it would be and more! Great Job Miss Janice! I love this, so much. It makes me smile real big. 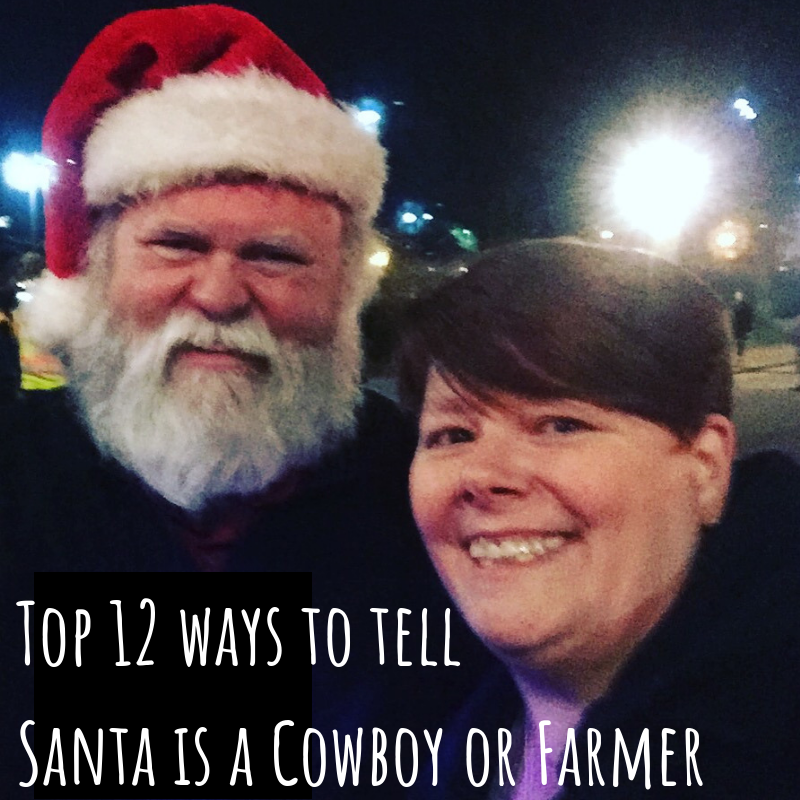 Santa is definitely an ag man. There’s no way to refute the evidence. You have a point or a few actually! Santa never stops giving, even when people quit believing or aren’t thankful for his hard-work anymore. Sounds like a lot of farmers I know! I bet he doesn’t sleep til he knows that everything under his responsibility has been cared for, and if something happens in the middle of the night, he leaves his home to make sure it is taken care of and everything will be ok.
OOOH… Good points there Sam!